Every batch of mouth-watering toffee is made by hand in small batches. We only use the finest ingredients, including: velvety sweet chocolate, fresh Georgia pecan pieces, and creamy butter. Our toffee is offered in two sizes (8oz and 14 oz) and three packaging options. Jenny and Joan Murray have known each other for many more than the twenty years they have been sisters-in-law. Married to brothers Michael and Mark, they cherish a sisterly bond that prompted them to explore new and fun endeavors together. A few years ago Jenny and Joan decided to put their culinary skills to good use by making toffee to give to family and friends for holiday treats and special occasions. Stay-at-home moms living in Greensboro, North Carolina, Jenny and Joan perfected their technique and kept up a brisk toffee-making pace. Through the years, the list of people who enjoyed their toffee grew and grew. Jenny and Joan’s time in the kitchen increased as the compliments and accolades about their toffee flourished. Greensboro friends spread the word about their delicious concoction and their toffee was soon in high demand. Backed with a reliable and honorable reputation, Jenny and Joan decided to expand their talents into a serious toffee enterprise and in 2006 Two Sisters Toffee came into existence. In addition to their expanding and loyal clientele, Two Sisters Toffee has increased their distribution by making their toffee available at local shops, bazaars, and markets. 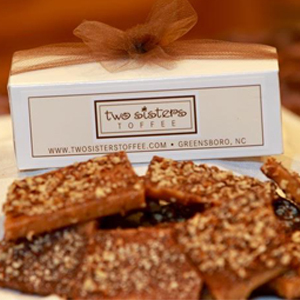 Two Sisters Toffee is a repeated vendor at the well-respected the Greensboro Farmers Curb Market at Yanceyville. This North Carolina market, dating back to 1874, is one of the oldest, most well-respected markets and prides itself on a friendly and festive atmosphere featuring 2nd and 3rd generation vendors and shoppers. Two Sisters Toffee has been a vendor during the Market’s Holiday, Christmas and Spring Shows for several years – consistently providing their devoted customers with their delicious and hand-made toffee. Every batch of mouth-watering toffee is made with only the best ingredients, including: velvety sweet chocolate, fresh Georgia pecan pieces, and creamy butter. All the while, Two Sisters Toffee has provided an exceptional product at a reasonable and affordable price. Two Sisters Toffee’s package is charming and distinctive. Consisting of a sturdy white candy box with toffee nestled into a pillow of scarlet food tissue, the box is then safely secured with their signature chocolate tulle ribbon. Due to their localized distribution, it has been Jenny and Joan’s privilege to prepare and package every box of toffee while personally knowing the majority of their customers. Always conscientious of their product, Two Sisters Toffee is prepared by Jenny and Joan in a hygienic and sanitary environment.Two Sisters Toffee is proud of their delectable toffee, enduring customers, and prompt shipping and delivery policies.